This medication may rarely cause an inflammation of the heart muscle (myocarditis) or heart failure. Get medical help right away if you develop chest pain, fast/irregular heartbeat, trouble breathing, or swelling ankles/feet. Who should not take Clozaril? What conditions does Clozaril treat? Drooling, drowsiness, dizziness, lightheadedness, headache, shaking (tremor), vision problems (e.g., blurred vision), weight gain, and constipation may occur. Many of these effects (especially drowsiness) lessen as your body gets used to the medication. If any of these effects persist or worsen, contact your doctor or pharmacist promptly. Tell your doctor right away if you have any serious side effects, including: facial/muscle twitching, seizures, uncontrollable movements, interrupted breathing during sleep, trouble urinating. Get medical help right away if you have any very serious side effects, including: severe dizziness, fainting, mental/mood changes, difficulty breathing with exercise, sudden weakness, pain/redness/swelling of the arms/legs, persistent nausea/vomiting, stomach/abdominal pain, yellowing of eyes/skin. List Clozaril side effects by likelihood and severity. Before using this medication, tell your doctor or pharmacist your medical history, especially of: history of blood disorders (such as leukemia, low white blood cell count), bowel problems (such as paralytic ileus, irritable bowel syndrome ), breathing problems, diabetes/family history of diabetes, high cholesterol/triglyceride levels, glaucoma, heart problems, kidney problems, liver problems, obesity/family history of obesity, seizures, difficulty urinating (for example, due to enlarged prostate), breathing trouble during sleep (sleep apnea). The risk of QT prolongation may be increased if you have certain medical conditions or are taking other drugs that may affect the heart rhythm. Before using clozapine, tell your doctor or pharmacist of all the drugs you take and if you have any of the following conditions: certain heart problems (heart failure, slow heartbeat, QT prolongation in the EKG), family history of certain heart problems (QT prolongation in the EKG, sudden cardiac death). What should I know regarding pregnancy, nursing and administering Clozaril to children or the elderly? Other medications can affect the removal of clozapine from your body, which may affect how clozapine works. Examples include fluvoxamine, rifamycins (such as rifabutin, rifampin), St. John's wort, drugs used to treat seizures (such as carbamazepine, phenytoin), among others. Does Clozaril interact with other medications? If you miss a dose, take it as soon as you remember. If it is near the time of the next dose, skip themissed dose and resume your usual dosing schedule. If you miss doses for longer than a day or two, consult your doctor for a new schedule to get back to the dose you were taking. Do not double the dose to catch up. 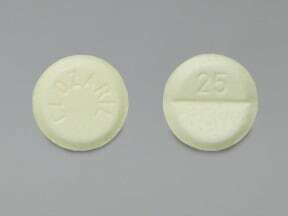 This medicine is a pale yellow, round, scored, tablet imprinted with "CLOZARIL" and "25". 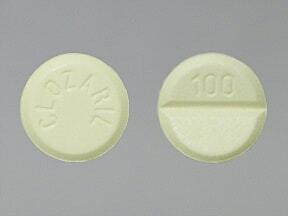 This medicine is a pale yellow, round, scored, tablet imprinted with "CLOZARIL" and "100". Are you considering switching to Clozaril? How long have you been taking Clozaril?